The Minnesota Astronomical Society invites you to the 12th annual Camping with the Stars taking place at the Eagle Lake Observatory. In the spring of 2008, the MAS was approached by REI and Astronomy magazine to host one of their “Campout with the Stars” events for 2008. Nationwide, there were dozens of similar events throughout the summer hosted by astronomy clubs across the country. That first year success coupled with the 2009 International Year of Astronomy prompted us to continue the tradition. The MAS Eagle Lake Observatory is located within Carver County Baylor Regional Park, about 45 minutes Southwest of Minneapolis and 3 miles north of Norwood-Young America. 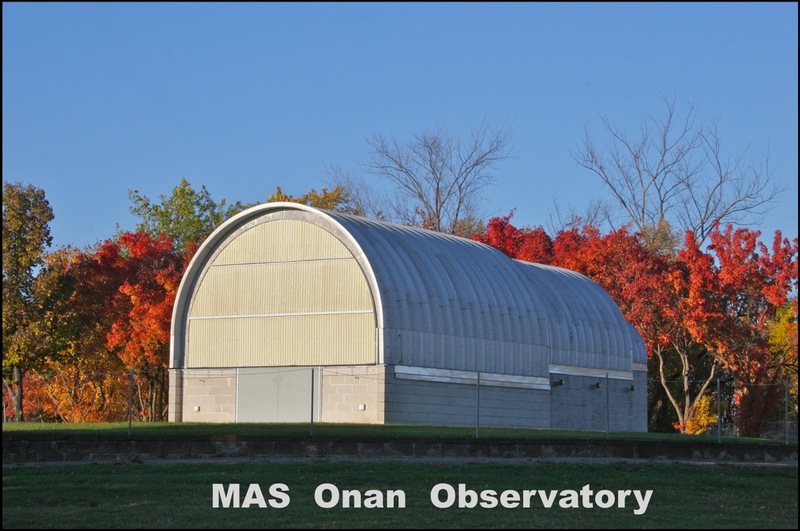 For additional Information on the MAS Eagle Lake Observatory, visit the Eagle Lake Observatory webpage.Eagle Lake Observatory consists of the Onan Observatory, the Sylvia A. Casby Observatory and the HotSpot Classroom. Each observatory is handicap accessible, state-of-the-art facilities with robotic telescopes ranging from 4 inches to 20 inches of aperture and are ready to show you the skies. Come see the stars through our five telescope platforms that include a 14” and 16” Schmidt Cassegrain telescopes, 8” TMB design refractor as well as numerous other telescopes or sit back and enjoy live video of planets, star clusters, galaxies and nebula on the observatory imaging system. Enjoy a tour of the sky by one of our dedicated volunteers or bring your own telescope. There will be talks, prizes, solar viewing, and fun activities throughout the day and into the night. Baylor Regional Park offers 50 camping sites. Thirty-five sites have water and electrical hookups and 15 sites are primitive. For the Camping with the Stars event, the park opens up additional campsites at the foot of our observatories where you can set up your own scope or take the short walk to view through some of the best amateur telescopes available. Other facilities include: picnic areas, showers, swimming beach, beach house, reservable picnic shelters, sand volleyball court, group camping area and horseshoe pits and an 18 hole disc golf course. Call the Carver County Park Office at 952-466-5250 to register and reserve your spot. Check-in for campers begins Friday afternoon. Check-in will be at the Baylor Park office. After your checked in and set up, stop by the observatory where we will be starting the weekend with a Star Party beginning at 7:00 pm. We will begin with solar viewing and other daytime objects. 10:00 – Live Laser Tour of the Night Sky (Weather permitting) – Step out to the plaza, and get a guided tour of the night sky. Learn to find the North Star, the planets and more. The observatory will open by 1:00 pm on Saturday for daytime viewing of the sun, stars & planets (if clear). 5:30 MAS Cookout & Potluck Picnic / Supper break – The MAS will be hosting a potluck cookout for registered campers and MAS members. Bring chips, a salad, a dish or a dessert and join the feast. 8:30 Raffle prize drawing in the HotSpot Classroom. The observatory will open by 8:00 am on Sunday for daytime viewing of the sun, stars & planets (if clear). 8:00 am Continental Breakfast – Morning coffee & donuts (Juice for the kids) – Celebrate the day of the Sun with views through the solar observing telescopes and binoculars. The observatory will be open throughout the morning and early afternoon. Activities conclude at 2:00 pm. More than a dozen telescopes to view through, are among the finest amateur telescopes available. Electrical outlets on the outside of the building for those who bring their own scopes. Our newest domed observatory houses three telescopes on a AP 3600 mount. 8″ TMB design refractor and Mewlon 300 telescopes for excellent planetary and deep-sky viewing. Lunt 152 Ha Solar telescope and other solar filters allow safe viewing of the Sun’s surface, prominence and sunspots. Heated and air-conditioned seating for as many as 70. Ten foot projection screen for video presentations. Real-time video viewing capabilities from the observatories telescopes.